No, this is not a quickie paperback rushed into print after September 11. The Frommers&#146; book, subtitled An Oral History of Life in the City During the Mid-Twentieth Century, is a loving look at a Manhattan that now seems impossibly distant, a Manhattan whose citizens worried about open admissions at City College and how they felt about the Beatles and whether they could afford to live on the East Side&#151;but never about terrorist bombers. It is a Manhattan now lost to us forever, a Manhattan to be recollected in tranquility and cherished as never before. The Frommers&#146; mid-twentienth century ranges from the early post-World War II years to the mid-1970s, when the city nearly went bust. 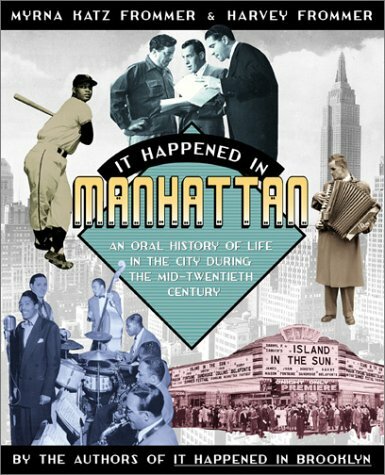 Like their earlier books (It Happened in the Catskills, It Happened in Brooklyn, It Happened on Broadway), this one is an oral history, an irresistible collection of interviews with Manhattanites rich and poor, talented and ordinary, famous and unknown, clearly united in their unanimous conviction that Manhattan was, is, and always will be the most exciting place on earth. Here is a New York in which the Third Avenue el still existed and traffic on Fifth Avenue ran both ways, in which eleven daily newspapers covered the city beat and Walter Winchell and Ed Sullivan covered cafe society; in which proper young working girls still wore hats and white gloves and businesswomen couldn&#146;t get bank loans; in which Lincoln Center was going up and Penn Station was coming down and SoHo was still a dream in a gallery owner&#146;s eye. Here are Jewish kids growing up on the Lower East Side, black kids growing up in Harlem, Italian kids growing up in the Bronx with Manhattan only a fifteen-cent train ride away. Here are politicians and performers, priests and rabbis, press agents and jazz musicians, restaurateurs and fashion designers and Tin Pan Alley songwriters, all talking in that excited New Yorker way about what a great time they had in their great city. You can almost see the hands waving. Not many of these voices will be known to those unlucky enough never to have lived in Manhattan. Jimmy Breslin and Pauline Trigere and Robert Merrill and Jane Jacobs, most likely, but not that many others. Who but a Manhattanite will know Elaine Kaufman as the owner of a restaurant called Elaine&#146;s? Who outside of the advertising business will recognize Jerry Della Femina? Who but a New Yorker will remember the political ins and outs that brought us Robert Moses and Robert Wagner, Abe Beame and John Lindsay? It really doesn&#146;t matter. The voices of the unknowns, with their tales of chocolate egg creams and 15-cent subway rides and standing room only at the old Met, are as stirring as those of the famous. Organizationally, the book suffers from a lack of focus, as is perhaps inevitable with a subject so broad, and the authors&#146; affinities are far too obvious: food is big, show biz is big, high fashion is big, sports are negligible, Wall Street is non-existent. One looks for a little more high finance and a little less Toots Shor. Still, it is peevish to carp about the content when all of it is so fascinating. The presentation, however, merits carping. Although the cover is quite handsome, the inside of the book is a mess. Many of the &#147;vintage photos&#148; are simply bad: over-exposed snapshots, lousy architectural photography, irrelevant street shots. If this were a visual portrait of 19th century Cleveland, one might argue a dearth of material. But Manhattan since World War II? Surely the supply is limitless. And was the art director actually trying to imitate my high school yearbook? The photographs, good and bad, are junked up with corny design techniques straight out of the 50s: vignetted shots fading into nothingness, portraits in icky little ovals, and&#151;most inexcusable&#151;full-bleed photographs inadequately screened back so that the text running over them is illegible. This is not a book you want to try to read in a dim light. Missing completely is what the book really cries out for, which is a map! Manhattan is ridiculously easy to understand cartographically&#151;it&#146;s an island, it&#146;s long and skinny and flat, it&#146;s laid out on a grid&#151;and the non-native would be immeasurably helped by a depiction of the relative positions, let us say, of Harlem and Central Park and Greenwich Village.